I’ll commit, I won’t quit. 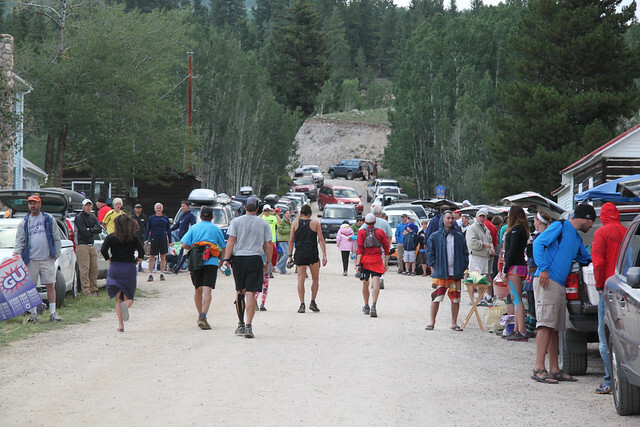 For the 3rd consecutive year, I lined up in Leadville to run 100 miles. 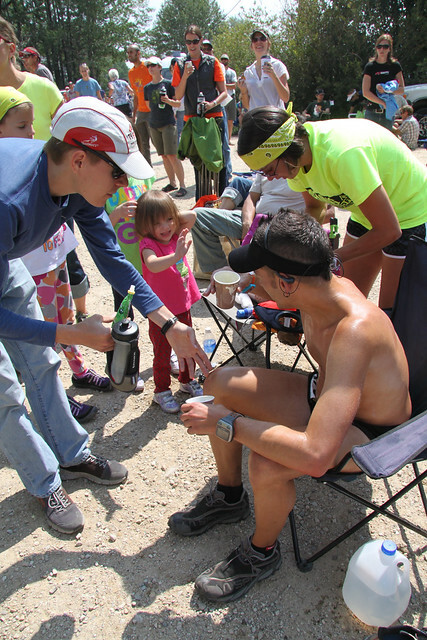 Having completed 100 miles back in June at the Western States 100, I had some added confidence. But leading up to the race I had my usual worries. Once again on paper, I felt like I had this race in the bag. But you never know until the gun goes off. I had been told by everyone in the world that I went out too fast last year. I was ready to rectify that this year. I lined up at the start in the 2nd row just to be with all my buds but quickly dropped back after we start rolling of the start line. I was in no hurry to get to Mayqueen this morning. I stopped near the Tabor Boat Ramp to do my business and then got back in line very causally behind a freight train of people. The train was so long that they kept getting into traffic jams going around the lake. I actually found myself walking a lot around the lake as my pace was fast enough to keep in formation. I arrived at Mayqueen in 2 hours and change then proceed into the aid station where I ate 1 of everything they had. My plan was to fuel early and I stuck to it. I mixed up running and hiking to get to the summit of Sugarloaf. I was looking at my target splits and I had plenty of time to get there. I took the Powerline descent very easy and rolled into Fish Hatchery right on time. This was seemingly going according to plan. I left Fish without a bottle on accident and my sister made the run back to get it then back out to me on the road in a total sprint. Such dedication. As is the case every year, the road to Pipeline sucked a bit of the life out of me. It felt very familiar. I was lucky that my wife and kids had just arrived on the scene though and were cheering me on down the road. Definitely broke up that section for me. I came into Pipeline feeling OK. I took time to stretch out my quads and there was nothing sore as of yet. My crew was spot on at each stop making me eat, working through the list of things available, and more. I rolled out of there and was on the way to Half-pipe. This section always does something to me. Deva vu. The rollers through there just seemed to be insurmountable. I kept finding myself slowing and then moving to a fast hike. This was runnable stuff but I seem to gravitate towards more aggressive terrain. This wasn’t doing it for me. I came into Half-pipe and did a quick split check and I had fallen off the mark. That just meant that more people usually run more of that. From there, its similar stuff on the way to Twin Lakes. I wasn’t gaining positions but a few folks slipped by as I was being overly cautious with my effort level through this section. It just drags on for me. As we start finally dropping into Twin Lakes, I felt myself pick up speed and that seemed like I was back to normal. But I quickly figured out that I was 15 over on my arrival split there. I had buffer but this wasn’t a good thing. My crew was waiting in Twin Lakes with a shoe change. We got that done and I was off. Probably a longer stop but I was busy the whole time. The river crossing was the lowest I had ever seen. All the preceding gross puddles of dirty water were gone to my surprise. So it made for a quick trip over to the start of Hope Pass. Frankly, I was looking forward to this climb. This is one of the 2 key things I worked on over the winter. So I changed gears and started pushing uphill. Last year, I was constantly out of breath and being passed by everyone. This year, it was much different. I was passing the weaker climbers and keeping in range with some set of equal climbers. It felt good. I made good time on the climb but was excited when the descent began. I always have trouble switching gears on that descent. Probably took a mile before I really started feeling loose and was moving well downhill. Another guy came up behind me and we moved swiftly together to the new junction for the singletrack to Winfield. I wasn’t too sure how this section was going to go. The road we used to take always sucked but it was a known quantity. This new trail was back to that rolling terrain that seems to zap me. There was a decent amount of sun exposure so it was getting hot. I wasn’t pacing well through there and found myself walking a lot. I really started losing all that time I had made up on the climb on this section. I was mentally getting distraught. I could see Winfield but the trail just kept going west. Then eventually we cut back to Winfield and I jogged in an hour behind schedule. I refueled a bit, picked up my pacer, Nick Pedatella, and we were off. Nick like all new pacers was hopping to run. I wasn’t. There was a gradual uphill to regain that trail so I was locked in hike mode until we reached it. We made our way back to the Hope Pass trail and began to climb. This climb is the worst in the race. Its steeper than the other side. I have bonked, puked, and nearly passed out on it over the years. This year was better. Probably 100% better. We actually did some passing but also were passed our fair share. I didn’t have to stop to regain my lungs at any point. It was just nice and steady to the top and I think we had some conversation a bit long the way. I tried to run back down Hope Pass more conservatively. In prior years, I think I bombed down to fast and it took it out of me. So we made good time and held position mostly on the descent. After re-crossing the river, I stared hiking behind Nick. I found out I could hike and keep up with him just as good as running. He wasn’t happy with it. But I just didn’t feel like I had a lot of gas to push. 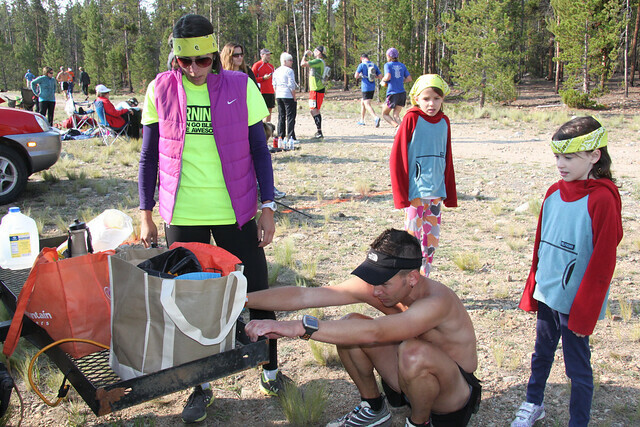 We rolled into the aid station at Twin Lakes and went into preparations for night fall. I changed my shoes back to my Hokas. I found the Crosslites seemed to destroy my feet more in that 20 miles back and forth to Winfield more than the 40 miles prior. Nick and I started hiking up out of Twin Lakes. I felt like I was moving decently through there. The splits seemed faster. But things were setting in. My return from Hope Pass took an extra hour over my splits. Combine that with the hour I had lost in the first half and I was over the mark already. But anything can happen. Repeating history, I found fresh wheels on the way to Half-pipe. Came in there with about 7 minutes more lost on the splits but the data shows it was nearly 30 minutes after than my outbound trip through that section. We met the crew at Pipeline in the dark and I bid Nick farewell. I picked up my next pacer, Eric Jungbauer, and we headed out. It was fun to have some fresh blood in the mix and Eric was excited for his short stint over to Fish. I found myself getting colder through this section and had to stop a couple times to layer on more clothes. This seemed like a bad sign. Fish was a turning point last year for me at this race and I didn’t want to repeat. I changed pacers again at Fish picking up JT for the Powerline climb. 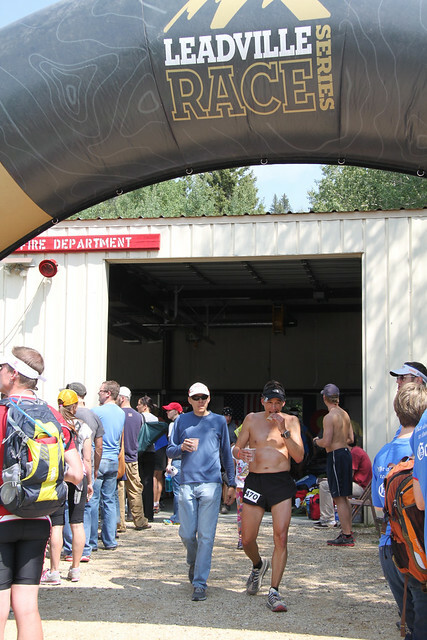 We chatted on the road as he had some data on the race winners and other events on the day that I was sorely lacking. We turned on to Powerline and I was determined not to bonk here this year. I put my hike to work and all my practice on this hill into play. I ascending without ever breaking stride. It was light years faster than 2011. After topping out it was time to run but my legs wouldn’t have it. They were stiff and solid and I could not loosen them up. I did some squats but it wasn’t helping. Running was also starting to make my stomach feel very unsettled. I started getting really cold too. I bundled up with everything I had on but was still losing heat. We made our way through the Colorado Trail. I was moving quickly but I was not running. I couldn’t find it. 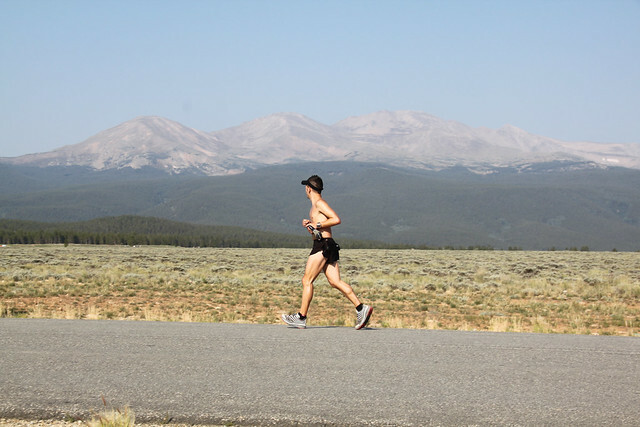 My lungs started their usual Leadville gasping. We popped out on the road and found the crew at the truck. JT quickly popped open a cold one while I jumped into the truck and re-outfitted myself with pants and a down jacket. I needed to get warm fast. Final pacer change with Natalee coming on board for the trek back to town. With my legs all stiff and my lungs not cooperating, it was going to be a long 13 miles back to town. I told Natalee about the ridiculousness of walking from Mayqueen to the center of Leadville. But that was our mission. I wasn’t moving as swiftly at this point. I was zoning out. Natalee could sense it but I was trying to dull the pain. I knew we had a course PR in the bag with just walking. So we did. It seemed to take forever to get to the Tabor Boat Ramp. When we did, I glanced at my watch to see 25 hours on the clock. I was 7 miles short of the goal time. This return always takes a long time and I had hoped I would be in better shape here but I was not. We kept motoring. The sun rose for the 2nd time on this run as we were on Turquoise Lake Road. My home was a mile up that road but I couldn’t go there just yet. We turned onto the Boulevard and made that journey to the top. I had to keep convincing myself to continue. I wasn’t going to drop but I just wanted to be somewhere else. I finally got into it a bit once we hit pavement and started towards the finish. There was no magical moment as I headed down 6th street. I found myself slowing to be sure this big group surrounding a runner in front of me go through so I could get a clean finish line photo. I crossed the line and was done. There were no tears or emotion this time. It just felt like a repeat of what I had done there before but slightly faster. 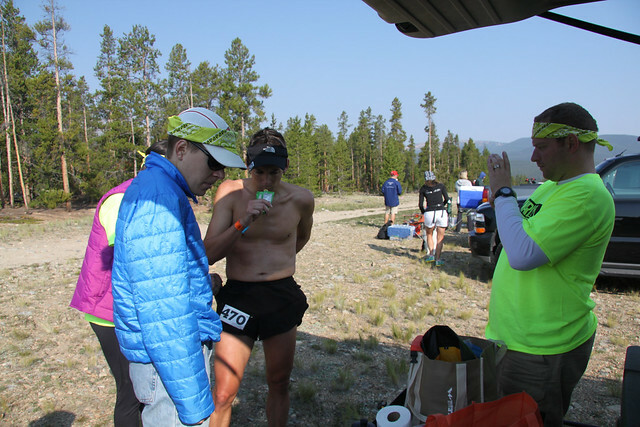 I avenged my 2011 DNF but not in a amazing fashion. Another running season in the bag. Thanks first and foremost to my wife, Kim, for putting up with this thing once again. 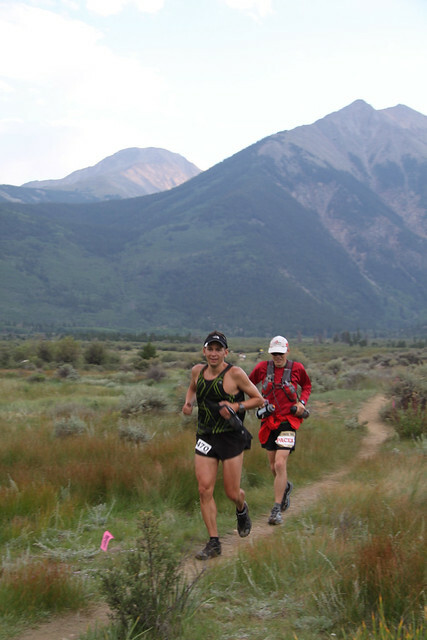 It was a busy summer of running-related events culminating in me disappearing for August to be in Leadville fulltime. I hope I made you proud. Thanks to my sister, Natalee, for crewing me once again. She did it as WS100 and LT100. Giving up two weeks of her summer plus travel to support my efforts when I used to just beat her up and stuff as kids. I am lucky that she likes this scene so much. 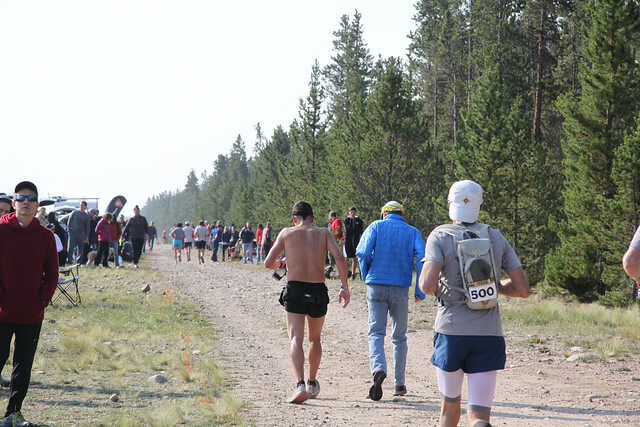 Thanks to my friend, Eric, for coming out and being part of this at WS100 and LT100. It was fun having your fresh perspective to remind us that this is crazy. Thanks to pacer Nick Pedatella for coming up early, advising me for many years, helping the crew out during the day, pacing, and hand feeding me turkey while I ran. Its amazing to have friends at this caliber step in and help me finish these races. Thanks to pacer, JT, for coming up from Colorado Springs after racing that morning and doing the late night shift with me over Powerline. He kept me moving and probably felt my frustration and tried to keep my spirits up. 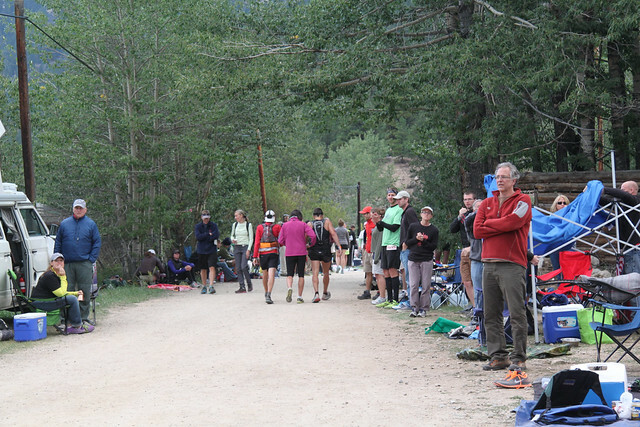 The dude even stayed to watch me finish and then drove back home to watch his fiancee cross the finish line at Pikes! I wish I had his energy. Thanks to all my fellow runners and friends here in Leadville. Once again, you made me feel like a celebrity out on course by constantly yelling my name. I lost track at some point but there were over 90 shout-outs along the way from runners who came up by me or we passed going the other way and you called me by name. I didn’t know 1/2 of you but I wish I did. 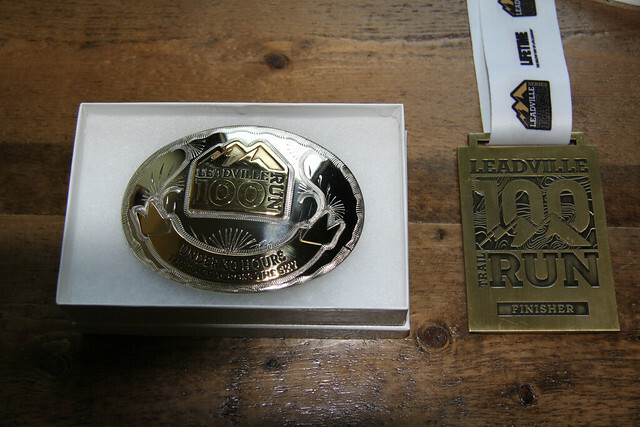 I am proud to be a 2 time Leadville finisher. I am proud that I was able to complete two 100 milers in one summer. But there was a sting to not getting that big buckle this time around. But I made peace with it in those last 13 miles going around the lake accompanied by my sister. I will reflect a bit on where I went wrong in another post. I gave it a shot 3 times and came up short each time. It feels like I need to step away now. 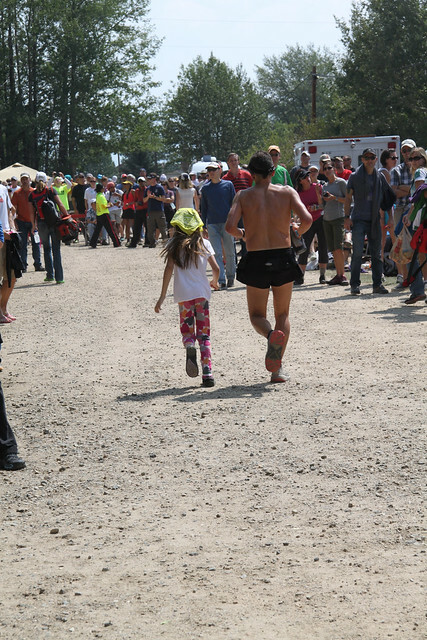 People asked me after WS100 if I would go back. After I thought about it, I decided no — unless I felt I had some distinct new edge that would catapult my results. Leadville feels the same at this point. But that could be the “day after” talking. I am the self-proclaimed mayor of this town for god sakes.